Housing costs may be the most important factor people consider when choosing where to live. But safety is often a close second. When deciding where to raise a family, for example, many parents place a premium on safety. Living in a safe environment means more than just a place with little crime. Breathing in polluted air is dangerous and living in cities with reckless drivers is also a cause for concern. Below we delve into data on these and other factors to rank the safest cities in America for 2017. In order to rank the safest cities in the country, we looked at data for the 200 largest cities in the country. Specifically, we looked at data on crime rates, vehicular mortality rates, drug poisoning rates, the percent of residents who drink excessively, the quality of air and the percent of commuters who drive to work alone. Not much change – Many of the safest cities last year are still safe today. In fact seven of last year’s top 10 made appearances in the top 10 this year and the top two cities kept their places. Unsafe Missouri? – Missouri has three cities in our bottom 15. Only California can match that score. Kansas City in particular suffered from high violent crime rates. 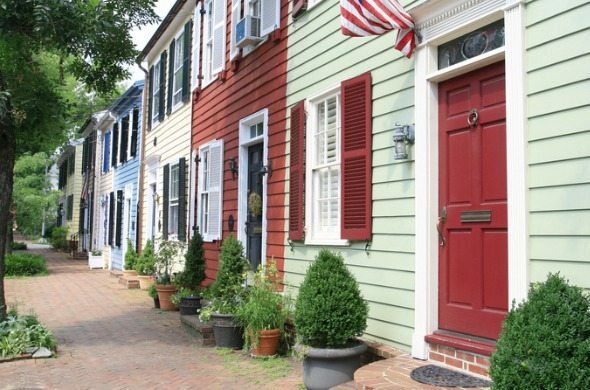 This is SmartAsset’s third annual study of the safest cities in America. Read the 2016 version here. 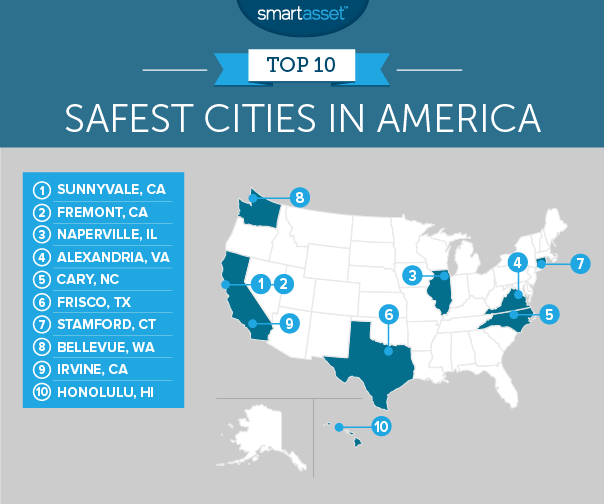 Sunnyvale is the safest city in America for the third straight year. Not much has changed in this city. It still ranks well in both crime measures: It has the seventh-lowest violent crime rate and 10th-lowest property crime rate in the study. There are also very few drug overdoses in this city. Sunnyvale sees about 7.5 drug overdose deaths per 100,000 residents, a score beaten by only 7.5% of cities. One area Sunnyvale could improve in is its air quality. This city ranks only 67th in terms of air quality. Fremont, like Sunnyvale, occupies the same spot it held last year. Residents living in Fremont have little to fear from local crime. There are only 178 violent crimes per 100,000 residents. It beats 85% of the cities in this study in that metric. The city also has some of the most careful drivers. According to our data, there are only 5.23 deaths due to traffic accidents in Fremont, a top 15 rate. Naperville jumped three spots from last year’s analysis to take third. The Illinois city put up some spectacular scores this year. Take its crime numbers for example: Naperville has the second-lowest violent crime rate and the second-lowest property crime rate. The reason Naperville didn’t rank even higher is because of its air quality and drug usage statistics. About 75% of cities in our analysis had higher scores than Naperville in those two metrics. Alexandria dropped one spot from last year. One reason why Alexandria is such a safe city to live is its strong public transportation links. Evidence of the benefits of public transportation are shown in the low number of traffic deaths. This city has the fourth-lowest traffic death rate in the study, at 3.92 per 100,000 residents. Cary is another nearly crime-free city and is the only North Carolina city to appear in our top 10. There are only about 1,100 total crimes per 100,000 residents. For both violent crime rate and property crime rate it ranks in the top 5. It also has a relatively low number of drug overdoses. Cary has 8.1 deaths from drug overdoses per 100,000 residents. It ranks in the top 16% in that metric. Frisco is the safest city in Texas, according to our data. This city sees almost no violent crime. In 2016, FBI data shows there were only about 126 total violent crimes in Frisco. That equals 77 violent crimes per 100,000 residents. Stamford is a newcomer to this top 10 and the only Connecticut city to crack the top 50. It ranks in the top 25 for fewest traffic-related deaths per 100,000 residents. There are only 5.41 traffic-related deaths per 100,000 residents. The city has a better score in low property crime rate than in low violent crime rate. Stamford has the 18th-lowest property crime rate in the study but only the 41st-lowest violent crime rate. Bellevue is Washington’s lone representative in the top 25. This city’s scores are a bit of a mixed bag. It scores in the bottom half for drug overdose rate, excessive drinking rate and property crime rate. However, in the other metrics, it ranks no lower than the top 25%. In particular, Bellevue has a very low rate of violent crime. There are about 97 violent crimes per 100,000 residents in Bellevue. That’s the sixth-best rate in the study. 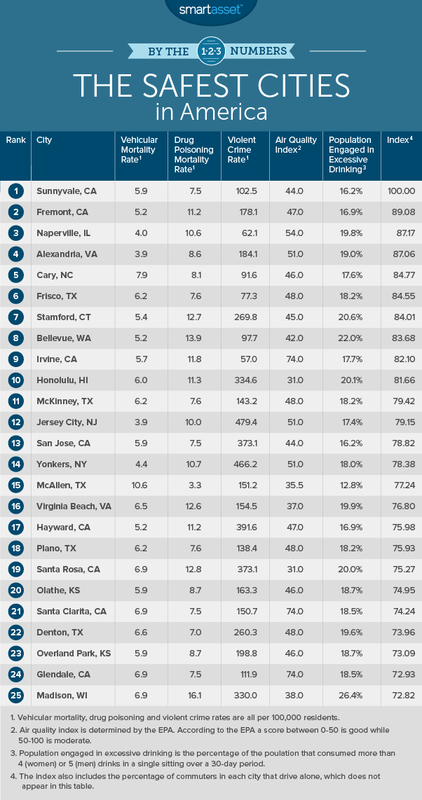 Irvine is the safest SoCal city we looked at. No city beats Irvine’s violent crime rate of 57 per 100,000 residents. It also has the 11th-lowest property crime rate. However its residents’ health would improve if they had access to cleaner air. Of all the cities we looked at, Irvine has the 25th-worst average air quality. Honolulu residents enjoy the second-cleanest air in the country. Only Lubbock, Texas has cleaner air. It also has a fairly low number of traffic-related deaths. There are about six traffic-related deaths per 100,000 residents. A score that beats 82% of cities in the study. Hawaii’s capital was hurt by its drinking rate. Over 20% of residents engage in excessive drinking, the 30th-highest rate in our study. Violent crime rate. This is the number of violent crimes per 100,000 residents. The violent crime data comes from FBI’s 2016 Uniform Crime Reporting Database. Property crime rate. This is the number of property crimes per 100,000 residents. The property crime data comes from FBI’s 2016 Uniform Crime Reporting Database. Population engaging in excessive drinking. This is the percentage of adults who consumed more than four drinks of alcohol for women or five drinks of alcohol for men on a single occasion over a 30-day period, or who engage in heavy drinking which is defined as drinking more than one drink per day for women or two drinks per day for men on average. Data comes from countyhealthrankings.org. Air Quality Index. This is a measure of air pollution in each city. The Air Quality Index data comes from the Environmental Protection Agency. According to the EPA, a score of 0 – 50 is good and 51 – 100 is moderate. Commuters driving to work alone. This is the percentage of the workforce that gets to work by driving alone. The data on the percentage of commuters who drive to work alone comes from the U.S. Census Bureau’s 2016 1-Year American Community Survey. First, we ranked each city in each article. Then we found each city’s average ranking, giving a half weight to excessive drinking rate and drug overdose rate, and a double weight to violent crime rate. Using this average ranking we created our final score. The city with the best average ranking received a 100. The city with the worst average score received a 0. If you are worried about your home, and the valuables inside, make sure you shop around for a home insurance policy which fits your needs. Home insurance can be pricey so shopping around and comparing rates is a good idea. One good way to save money is to bundle insurance packages under the same company. Say you already have car insurance and are looking for home insurance. Often you can get a better deal if you bundle your car and home insurance together with one company. Like many things in personal finance, the best rates go to those with the best credit score. By keeping your credit score high, or raising it before shopping for home insurance, you can get yourself a better rate and save some money.